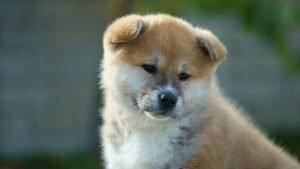 Have you seen our Akita puppies online? What about in person at our store? Did you fall in love instantly or are you still on the fence? We can help with your decision to buy one of our handsome Akita puppies! Despite their thick fur and fluffy coats, they really don’t require regular grooming. They don’t require trimming, but definitely, they need to be brushed. Brushing will keep their coats healthy and shiny, and it also aids in the shedding (because these babies shed!). Did you know that Akita puppies are referred to as the Great Japanese Dog, Japanese Akita or American Akita and are renowned for their incredible intelligence? Because they’re so darn smart, they are bored easily so they’ll need constant interaction. Training is an absolute must for them. Do you need an exercise or fitness partner? If so, purchase one of our Akita puppies and save the money on a trainer at the gym, because they’ll give you a run for your money. They are energetic, and the perfect workout companion for runs. They also happen to require daily exercise, so this is a win-win situation! Hands down, the Akita breed is one of the best watchdogs. They are normally quiet but if there’s an intruder or guest they will bark to alert you of any potential danger. The Akita can and will fearlessly protect its family. So, what do you think so far? Is this breed something for you and your family? Oh, speaking of which, we neglected to mention that they’re great with children! If you want even more information, you can contact us or come into our store to speak with one of our pet counselors. If Akita puppies aren’t for you, we can match you with another dog that will suit you and your family! Beautiful Boston Terriers at Petland! Boston Terrier puppies are a playful breed with gobs of personality and energy! They are the perfect pet companion for a person with energy to match! There is so much to say about the Boston Terrier’s personality and overall disposition that makes them a great addition to many types of families. They are incredible with children and considered one of the top kid-friendly breeds. They are sturdier than other small dog breeds so they can handle a little rougher play time. 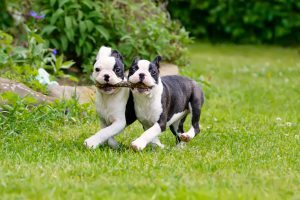 Should you purchase one of our Boston Terrier puppies, you’ll experience the joy of a comical and extremely playful breed. Did you know that Boston Terriers are one of the dogs breeds made in the U.S.A.? They are, in fact their name come from Boston, Massachusetts. Because of their sweet temperaments and beautiful tuxedo-like coats, they’re affectionately known as the “American Gentleman.” These dapper dudes have been an American staple since the 1960’s and have consistently been popular pups in households across the country. So what do you think? Do you have the energy to match a Boston? Do you have the family dynamics to welcome one of our Boston Terrier puppies? Need more information? We’ve got you covered. Take a look at some more interesting facts about these bouncing beauties! Once your Boston Terrier is full grown, they will range in weights from 14 pounds to as much as 28 pounds. They are generally healthy and have a lifespan of 12 to 14 years! We talked about their handsome tuxedo coats, so we want to share more information on how to maintain them. Thankfully they are relatively low maintenance. They only require an occasional bath and brushing. Both will control their minimal shedding and keep their coats healthy and shiny! Let’s cover their energy and exercise requirements. They need it daily to burn it off! Take them on a daily walk and allow them to play throughout the day. When walking them, make sure it’s not done for long periods of time in extreme weather. They can’t handle hot suns or cold temperatures. We could go on and on about our Boston Terrier puppies, but we want to know what you want to know! Feel free to give our knowledgeable pet counselors a call with any additional questions you have. Check out our available puppies page for a look at our Boston Terriers! Pomeranian Puppies Are at Petland! They are feisty, intelligent and one of the most recognizable breeds. We’re talking about Pomeranian puppies! When you see a Pom, you know a Pom. They are one of the most popular small breeds of dogs. They’ve been part of households across the world for years, but are they right for you? Here at Petland, we believe that there is always a perfect breed for every family, so do you think the Pomeranian is right for you? Read further to decide! 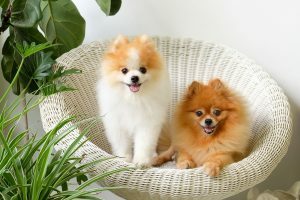 Part of the reason Pomeranian puppies are so loved is because of their unique fluffy coats! To keep them in a tip-top shape they’ll need regular brushing to keep it clean and healthy. You don’t need to shave or groom them, but brushing, as we mentioned, will help tremendously with their shedding. They shed moderately so you’ll want to stay on top of it. Poms aren’t the best with children, especially younger ones. They thrive best with adults, and seniors favor them. Pomeranian puppies need to be trained early with a firm hand because they are a bit stubborn. With positive reinforcement, they’ll respond faster and easier. Poms are no doubt barkers and a very protective breed, despite their little size! They adapt well to any living environment. Apartments are just fine and perfect since they don’t need a large yard. They are also very adaptable to any temperature, so hot or cold climates suit them just well. Pomeranian puppies aren’t particularly active, so around the house play and short walks work for them. Because of their petite and unassuming size, they are great companions for running errands! At Petland, we know that selecting the perfect pet for your home and family can be a complex and sometimes difficult decision. That’s why we have knowledgeable onsite pet counselors who can help you with your choice. We have Pomeranian puppies on sale and many more breeds. Check out our available puppies page and contact us for any more information or come to visit our store. Have you been recently thinking of purchasing one of our Boxer puppies for sale? We’re sure you’ve fallen in love with them, and so we’re going to give you even more information to fuel your fired up interest! Boxers are related to the Bullenbeisser and originated in Germany. They were brought to the United States after World War I and later used in World War II as guard dogs, messenger dogs, and attack dogs. Boxer puppies have lean muscular builds and strong jaws which is why they were used to hunt wild boar and stag. Boxers would capture the prey until their owners came. After World War II, American soldiers took ex-service Boxer puppies for sale home to keep as pets. We previously mentioned that Boxer puppies for sale are muscular. They have a natural regal disposition and shaped square heads. Males grow approximately 25 inches high and weigh anywhere from 65 to 80 pounds. Female Boxers puppies for sale grow slightly smaller. They will be 21 to 25 inches high and weigh 50 to 65 pounds. 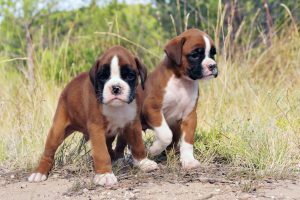 Boxer puppies come in two colors – fawn and brindle. Their faces are usually black; however many have white markings on their faces, chest, and paws. Almost all Boxer puppies for sale look like they’re wearing white socks! Boxers are generally healthy dogs, but like all breeds, they’re prone to certain health conditions. Specifically for Boxer puppies for sale, they are prone to the development of cancer, so you want to be sure that you’re taking your pup to the vet regularly for screenings and routine health monitoring. 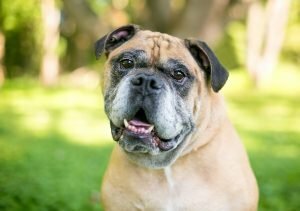 Another frequent concern for older Boxers is their susceptibility to gastric dilatation-volvulus (GDV), also called bloat. The Boxer is an extremely alert dog. They are intelligent with lots of high energy so be prepared. They are considered to be eternal puppies well into adulthood! As with all dogs, early socialization is necessary to make them comfortable with various people and situations. If you have kids in your home, they are the perfect pet. They’re gentle and friendly and can handle a little rough play from little ones! We can’t sing the praises for Boxer puppies for sale enough. They are an excellent breed for all types of family homes and living situations. If you’re interested in one of our Boxer puppies for sale, give us a call or come to visit our store today. Victorian bulldog puppies are strong and athletic canines. They are bulldogs after all, so that’s to be expected! Much like the English bulldog, they have broad muzzles, short and stout limbs, and wide nostrils. Their undeniably alluring eyes are wide set and sleepy low. Their teeth are large, and they have the signature underbite jaws that are uniquely bulldog characteristics. They are just a few inches taller than their cousin. These are just a few features of the Victorian bulldog, who has been described as a cousin to the English bulldog. 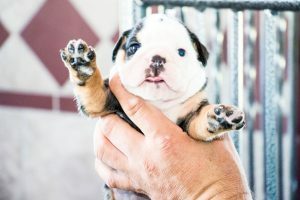 Want to see all of our adorable Victorian bulldog puppies for sale in our store? Just click here for our available puppies page! These pups are very easy going and they can fit well into any family, with or without kids. Although they may look intimidating, they are very docile and sweet dogs. Because they are so obedient and loyal, they make excellent guard dogs. They can also live in an apartment or larger home, but they will require regular exercise in order to keep their muscular bodies in shape. Although a small yard would suffice, you will still need to take your Victorian bulldog for walks. Victorian bulldogs have coats that are solid white, brindle, fawn, or red. They shed an average amount of hair. They don’t require regular grooming, but weekly de-shedding is recommended, especially if you want to keep a good handle on their loose hairs. If you’re not comfortable grooming your dog, take them to a professional groomer. Regarding their baths, they can be bathed up to twice a month. In between those times, pet-friendly wipes will work well. The Victorian Bulldog is part of the group of dogs that have short and flat snouts, which makes it difficult for them to breathe at times. During the summer, they shouldn’t be left outside for long periods of time. Conversely, they don’t do well in extremely cold weather either. Indoor environments are the best for their comfort, and high temperatures should be avoided at all costs. Victorian bulldogs are somewhat rare and definitely special! If you’re in the market, contact us today. If we don’t have any currently available, we can discuss other options of getting one for you and your family. Every time that you see Yorkshire Terrier puppies you fall in love. At Petland, we understand your adoration 100%, and that’s why we’ve decided to give you some basic information to help you in your decision-making process. 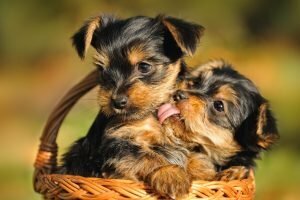 We know you’re going to want to purchase one of our Yorkshire terrier puppies after reading this post! You’ve been warned! Yes, Yorkies for sale are small, teeny even at times, but their little bodies are about the only thing small on them. They have such sweet personalities, and they’re downright comical at times. They are uniquely charming, intelligent, and extremely cute. They are packed with character that you’ll find endearing and entertaining. The Yorkshire Terrier originated in Yorkshire, England, during the late 18th century. They belong to the terrier category. The word terrier is rooted from the Latin word “terra,” which means earth or land. Yorkies were referred to as “land dogs.” This was primarily because these particular groups of dogs were bred to clean up rats from English farms, both below and above ground. Yorkies “suffer” from small dog syndrome. You know what that means? It means they think they’re big dogs in a little dog’s body! Yorkies are incredibly brave and courageous. We have to give full disclosure. Yorkies can sometimes be a bit bossy, too. This may be hard to believe, but they make great guard dogs. They will be barking to let you know of any intruders or strangers, but they can’t attack or apprehend a culprit. Because they can be aggressive at times, we recommend that when you purchase one of our Yorkies for sale, you socialize your pup as soon as possible with other dogs. Yorkies are sweet and energetic. To keep them in their healthiest shape, feed them a nutritious diet and take them for daily walks. You’ll enjoy them as much as they’ll enjoy you. If you have any other questions about our Yorkies for sale, give us a call or come to our store. Petland Stores: Everything you’ll need! Whether you’re thinking of getting a new puppy or you already have a dog in your home and need advice, one of our Petland stores can serve you. We are unique in many ways, and one is that we not only sell puppies but we also have everything you will need to care for your furry family member. Below are examples of what Petland stores offer you. For dogs with long or short hair, we have various shampoos and conditioners, de-shedding tools and supplements, brushes, and combs of all types. For their nails, we have nail clippers and files, should you decide to forgo professional services. In case of an accident, we sell styptic powder in all of our Petland stores. If you have young puppies or senior dogs, we sell premium food. Even if you have small breeds or large breeds, we have you covered! Of course, we have tons of different types of treats for your dogs. Whether you’re shopping for training rewards or snacks to keep your dog stimulated throughout the day, we have them all! Speaking of stimulation, Petland stores are stocked with toys that will entertain your dog for hours while you’re away or during casual playtime at home. For your pup’s comfort, we have doggie beds and crates, which can double for housebreaking assistance. In addition to food, we sell cute and fancy food and water bowls. Who says your dog can’t eat in style? What about clothing? We sell that too! When you visit Petland stores, you will have the option to purchase everything you need to make your new (or existing) dog comfortable, happy, and healthy in your home. We pride ourselves on being a one-stop shop. Do you have any additional questions about the services offered at Petland Stores? 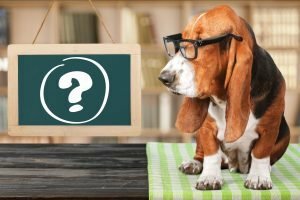 Do you need advice on a specific breed of dog? We have onsite pet counselors who can help. We are here for you! Just give us a call today. Have you been searching for “puppies for sale near me” online and feeling unsure of the results? 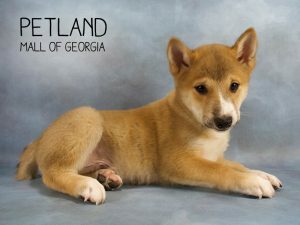 Well, set your uncertainty aside because here at Petland we have exactly what you need to answer your question of “where are puppies for sale near me?” We have a variety of breeds. Whether you’re looking for large dog breeds or toy breeds, we have them. Why purchase puppies from Petland? We’ve outlined three key reasons! Your puppy will be microchipped. Your puppy will have its first rabies vaccination. Your puppy will be checked by our partnered veterinarian. Your puppy will receive all of its first-year vaccinations. Hobby breeders as defined by the Animal Welfare Act. These are breeders who humanely raise their dogs. Local adoption pets that are vet-checked. Additionally, some of our puppies and kittens come from local animal shelters or members of the local community as part of Petland’s Adopt-A-Pet program, dedicated to finding homes for accidental litters. We offer financing for puppies! At Petland, we understand that a puppy may not be in the immediate budget and that’s why we offer financing. You probably didn’t guess that your search for “puppies for sale near me” online would generate a response that would allow financing options. 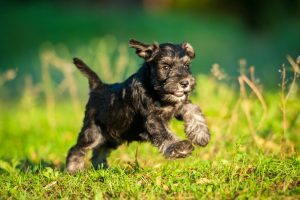 Financing your puppy will allow you also to purchase the necessary items to make the smoothest transition possible for your new furry family member. Getting approved is easy and fast. Contact us today and visit our available puppies page to get started! Sometimes, you really just know what you want. You’ve decided that you want to purchase a puppy and you’re searching “small puppies for sale near me” online. We have small puppies suited just for you at Petland. Below are some popular small dog breeds that we sell. Cavachon puppies are the adorable blend of a Cavalier King Charles Spaniel and a Bichon Frise. It’s said that they originated in the 1990’s and that the Gleneden Kennel takes ownership of developing and naming the breed. There’s no way that you searched for “small dogs for sale near me,” and the Mini Schnauzer at our store didn’t pop up in your search results. We always have these handsome little beauties. Their long, distinctive mustaches/beards and long eyebrows to match makes them a dapper hit. As an added benefit to their affable personalities, they do not shed much, so they are perfect for potential dog owners who have allergies. The teddy bear dog breed is a relatively new type of dog that was first discovered and introduced in 2000. These designer dogs consist of and are commonly known as the Zuchon or Suchon, which is a cross breed between the Bichon Frise and Shih Tzu. What do you get when you mix a Yorkshire Terrier with a Poodle? You get the cutest and most cuddly puppy called a Yorkiepoo! They are a delightful handful and are always willing to perform tricks or show off for any visitor in their home. They exude confidence and effortlessly command attention! Take one Maltese and add one Shih Tzu and you’ve got a recipe for one of the most fabulous small dogs. Searching for “small dogs for sale near me” undoubtedly to lead you to these fluffy play pals. They have been bred to be companion dogs, and they excel at the task. Just as with the Mini Schnauzer, they are hypoallergenic, so people with allergies purchase these puppies often, and they’re a hit! As pet owners, there will be times when you have questions about your pup. The concern may not warrant an actual vet visit, but it’s still valid nonetheless. Your question could be simple or complex. At any rate, Petland has the answer to your problem, because we have staff that is well-suited to assist you. In comes Solutions.Pet for your pet solutions! They are an experienced and extended branch of Petland with staff who are willing, able, and capable of assisting you with your various concerns. Solutions.Pet is an online space where you can ask questions and be provided pet solutions by pet professionals in real time. Anytime that you contact them, they will be able to access your previous calls or concerns. They keep a record of your inquiries, in addition to having a database full of answers to questions of varied topics. What’s the availability and turn-around time? The staff at Solutions.Pets works directly with clients and vets so that they can provide the most accurate pet solutions for you. Solutions.Pet has live representatives available Monday – Friday from 9 am to 8 pm EST, Saturday from 10 am to 8 pm EST, and Sunday from 10 am to 6 pm EST. You can submit unlimited concerns online 24 hours a day, 7 days a week. You will receive a response within 24 hours to your questions. This is an invaluable feature and benefit. Did we mention there’s no cost for these experts giving pet solutions to your problems? Solutions.Pet helps us to keep our Petland clients and pets happy. Feel free to contact one of our pet counselors if you have any questions about how Solutions.Pets works! You can visit the Solutions.Pets website by clicking here. Your peace of mind is worth it!